I painted this yesterday. 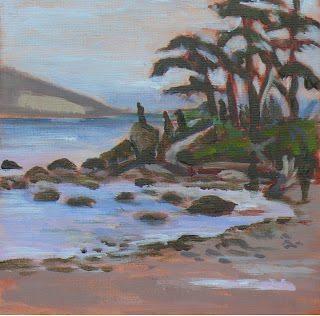 It was at a rocky shore in East Sooke Park. A grey whale had been washed up for a couple of days. Apparently killed by Orcas (you could seem a pod of Orcas in a hunt not far from where we were). People were still coming to see the dead whale even though the sun was setting. It had the air of a pilgrimage.